Monobenzone is the monobenzyl ether of hydroquinone. Monobenzone occurs as a white, almost tasteless crystalline powder, soluble in alcohol and practically insoluble in water. 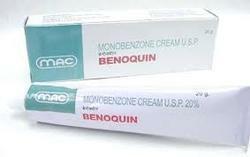 Benoquin cream contains monobenzone a chemical that is used to treat vitiligo, a skin condition in which irregular patches of skin lose colour and become whitened, due to destruction of the pigment producing cells called melanocytes.